The birth of America was a time of growth and opportunity; of ordinary people who pursued their aspirations in the hope of improving their lives. The efforts of some would lift them from poverty to riches. Such is the story of the Studebakers; five brothers who, through hard work and opportunities seized, ultimately became industrialists. Solingen, By Matth�us Merian - 1647. 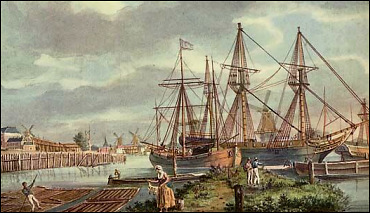 18th century Rotterdam, the Studenbecker's point of departure. and sailed on the Harle for Philadelphia. They arrived in the American colonies September 1, 1736 and eventually moved to Germantown, Pennsylvania to take up farming. In 1737 Peder and Clemens wrote home to their brothers in Germany and provided a penetrating and detailed description of life in colonial Pennsylvania. In the letter we find that the brothers were prospering and were happy with their decision to move to the colonies. They described various aspects of colonial life, stressing that anyone willing to work hard "can make a good living here." They went on to describe friendly relations with the "wild Indians" and expressed high respect for their behavior commenting that, "They put to shame the majority of nominal Christians." They however, expressed disapproval concerning the importation of African slaves. Twenty years after the Studenbecker's arrival in the colonies the French and Indian War erupted. Sadly, the Studenbecker's cousin Heinrich and his family were a casuality. Heinrich was killed in an Indian raid in 1756 and his expectant wife and children were taken captive. His wife and her baby were later killed as the natives fled. Thankfully, three of the children would eventually be rescued. 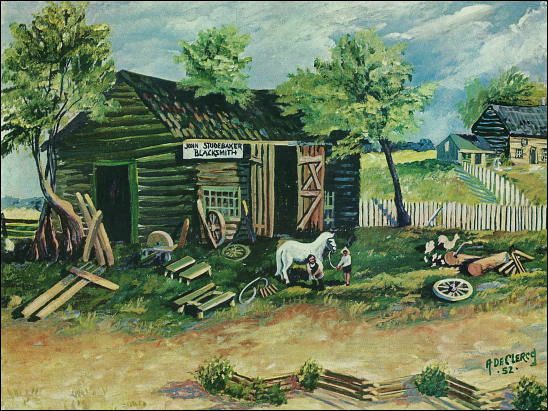 John Clement Studebaker's blacksmith shop near Gettysburg, PA.
Rebecca Mohler, an 18 year old from Lancaster. Purchasing some land in 1830 near Getty's Town (now Gettysburg), he built a house and work shop where he worked as a blacksmith and wagon maker. Industrious and devoutly religious, he ran his business on the philosophy "always give more than you promise". Times were hard though and his efforts at raising a family were not very successful. Not only was the country in an economic slump, but John C. had a charitable spirit towards those in need. He frequently undercharged people, accepted farm goods for payment or did work on credit for which he didn't collect. Additionally, he was known to co-sign loans for his church brethren, some of whom defaulted. Within five years he found himself deeply in debt and was forced to sell his holdings. John Clement Studebaker's covered wagon built in 1830. 1831 - 1901, his second son, went ahead a year before the family and found work in South Bend at the Eliakim Briggs Threshing Machine Works at 50 cents a day. He later took up a teaching job. Late in 1851 John C. Studebaker and family departed Ohio in that same covered wagon bound for South Bend. As the Studebakers settled in, Clement was teaching and Henry was blacksmithing for hire. Neither was happy with their arrangement and they endeavored to go into business. 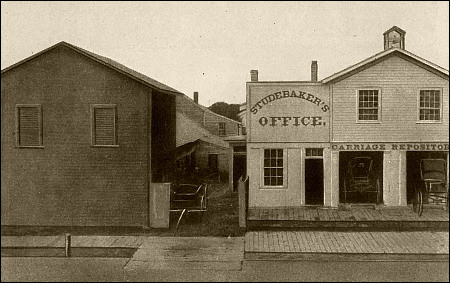 With the passion of youth, $68 and two sets of smithy tools, they established H & C Studebaker on February 16, 1852. The first day of business grossed 25 cents for shoeing a horse. A few weeks later they received their first wagon order from a Mr. Earl. The wagon was constructed and sold for $175. Business was slow though and they did whatever they could to make ends meet. 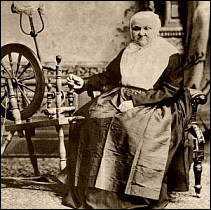 The end of the first year would bring just one more wagon order from a widow named Mrs. Stover. It appears Henry and Clement never received any cash for the wagon, just farm goods. By this time the third son, John Mohler, had come of age. He, like his brothers, had learned smithing and wagon making but his immediate desires lay west in the gold fields of California. When a wagon train passed through South Bend early in 1853, he proposed an arrangement wherein he would give them a new wagon in exchange for passage and board. It was agreed and his brothers helped him build the wagon in ten days. 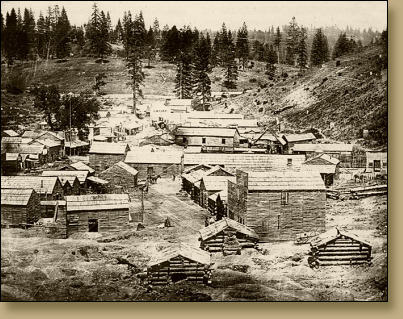 J. M. (as his family called him) arrived in Hangtown, California on August 31, 1853 with but 50 cents in his pocket. He had lost most of his $65 traveling money in a card game. Many a country boy has been fleeced at Three Card Monty. The anxious party of gold seekers had barely stretched their legs when a request went out from the town blacksmith for a wagon maker. J. M. acknowledged his experience in that trade but declined the request saying he was eager to begin prospecting. A stranger standing nearby, later identified as a Dr. Worthem, cautioned him that prospecting was risky and that the job just offered him was a fine opportunity. Impressed by his candor J. M. took the strangers advise but the smithy, Joe Hinds, was not building wagons. He was in immediate need of 25 wheel barrows and J. M. was to receive $10 for each wheelbarrow he completed. Accustomed to oak and hickory he did his best with the pitch pine at hand and finished the first one in two days. Upon hearing Joe�s criticism of his first effort, J. M. replied he was "a wagon maker, not a wheel barrow maker" and assured him the next one would be better. He would work for Hinds for the next five years becoming known affectionately as Wheelbarrow Johny. Years later in 1868 Joe Hinds went to South Bend and upon paying J. M. a visit, was hired as an assistant manager in the wagon works. 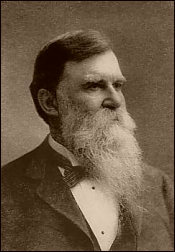 He would work for Studebaker until his death in 1879, by then reaching the position of superintendent. Hangtown would grow (becoming Placerville) and J. M. would save his money eventually accumulating $8000. Hangtown, California. It later grew into present day Placerville. While J. M. was in California, business had improved for Henry and Clement but they weren�t reaching their potential. They were now receiving some wagon orders but realized they could only turn out about a dozen wagons a year. Materials had to be purchased as needed, a wagon at a time due to a shortage of working capitol and mounting debt. Then their luck finally turned for the better. 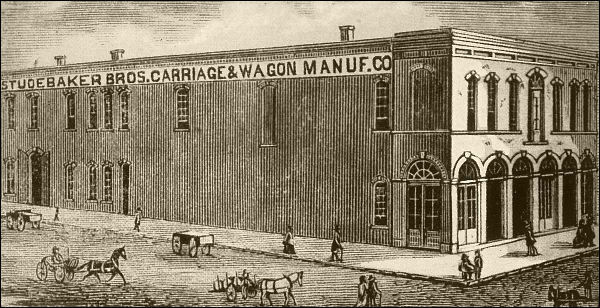 In 1857 the Mishawaka Wagon Works, near South Bend, had contracted with the Army for several hundred wagons. Realizing they could not fulfill their obligation, they approached the Studebakers for assistance. Henry and Clem enthusiastically agreed to deliver 100 wagons in 6 months. When their euphoria wore off they realized a daunting task lay ahead. Not only would they have to hire and train some help, there was the matter of lumber. They had none. There were trees for the taking all around South Bend but the wood needed 3 years to cure properly. Their solution was to construct drying kilns thereby reducing curing time to days. The project was masterfully executed and whatever couldn't be built, contrived or fabricated was farmed out. The wagons were delivered in 90 days but the brothers made precious little from the experience. Yet, in completing the Army order they had constructed or acquired everything they needed to build wagons in large numbers. H & C Studebaker was on the verge of something big. If they only had enough capital. 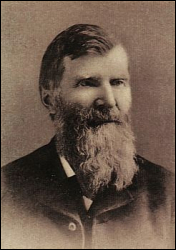 In April 1858, John M. departed Placerville to visit his brothers in South Bend. With his savings in a money belt, he journeyed home by way of San Francisco, Panama and New York. Upon returning he was greeted with enthusiasm but found H & C Studebaker languishing under judgments and moderate production. He also found that Henry wanted to quit the wagon business and take up farming. Anxious to participate in the family enterprise, J. M. used part of his savings to buy Henry out. Within the year John Mohler met Mary Stull, a farm girl of German descent and after a brief courtship married her on January 3, 1860. 1836 - 1897 Studebaker, John Clement's fourth son, got involved in the business. Peter ran a general store in Goshen and at J. M.�s urging, agreed to use his establishment to sell wagons. In the spring he constructed sheds to display the wagons and soon discovered he could sell them as fast as his brothers could deliver them. Convinced of the future of transportation in America, Clement and his new partner, John Mohler, began to expand. By the end of 1860 the wagon works employed 14 men and business was gradually improving. The Studebaker brothers were filled with optimism but the clouds of war loomed on the horizon. A Studebaker phaetonPhaeton - A lightweight, open carriage with large, slender wheels drawn by one or two horses. Because of the fast speed and lack of passenger restraints it was often considered dangerous. carriage built in 1857. It has been cynically observed that war is good business. This was the case with the Studebakers. When the Civil war broke out, Southern forces were unbeaten, the Union needed to catch up and Clement and J. M. were still struggling to grow their business. The Studebakers, for the most part, were devout Dunkards Dunkards or Dunkers. Also known as the German Baptist Brethren. Dunkards were strict pacifists. and did not participate directly in the war but they had no objection to accepting government contracts. Beginning in 1862 the Union placed orders for wagons, gun caissons and other war materials. For the Studebakers this was a windfall that required immediate expansion of their facilities. The wagon works continuously grew to meet demand as they supplied the Union throughout the war. Rebel forces were also familiar with these sturdy, well built vehicles since they were known to have commandeered them on numerous occasions including the retreat from Gettysburg. The Civil War did not put much money in company coffers but, once again, government orders had allowed the brothers to expand their facilities. Adventurous settlers were now moving west in droves and the wagon works in South Bend was poised to accommodate the surge in wagon sales. By wars end everything had finally come together. After more than a decade of hard work the Studebakers had an abundance of paying customers and a factory to supply them with gleaming new vehicles. From this point on the business grew phenomenally. As 1867 drew to a close the brothers valued their assets at $223,269.06 and in March of 1868 incorporated themselves under Indiana law. The new company was called the Studebaker Brothers Manufacturing Company and by the end of the year boasted 190 well paid employees. The brothers were able to capitalize it with $25,000 each with Clement being named President, J. M. the Treasurer and Peter, now in the firm full time, was Secretary. Aside from their titles, each used his individual talents to guide the company to new horizons. Clement attended to administrative matters while J. M. oversaw construction of wagons and carriages. Peter used his sales skills to create markets outside Indiana, vital to the kind of growth they envisioned. At last, the Studebakers were building wagons without orders and selling them. As 1868 ended, total sales exceeded $360,000. The St. Joseph sales branch opened in 1870 by Peter Studebaker. St. Joseph, Missouri was the staging point for wagon trains headed west and every spring would see a mass migration from there. It was natural then, for Peter to establish a sales outlet in this strategic location. About 1870 he and his brother-in-law set up the first Studebaker showroom outside of Indiana. But Peters vision of the future went beyond wagon trains and Missouri. He saw enormous sales potential in the country and knew his brothers could provide the merchandise. A famous anecdote asserts that Peter once said he could sell all the wagons Clem could make, to which Clem replied he could make all the wagons his brother could sell. In a few years Peter would have branch houses in Salt Lake, San Francisco, Kansas City, Portland, Dallas, Minneapolis, Chicago, New York and Denver. In 1870 sales exceeded $500,000. 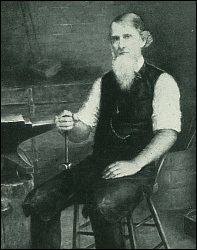 Jacob Studebaker, 1844 - 1887, was brought onboard as a salesman and eventually took charge of the carriage factory. Business was good and the factory was growing. By 1872 the main building was a block long and four stories tall. Behind it was a three story behemoth with thirty plus smoke stacks. Rail spurs were congested with locomotives moving new wagons and carriages to ever expanding markets. It appeared Studebaker was unstoppable. Then came three events that nearly brought it all down. The first occurred in June of 1872 when a fire broke out in the main building causing $70,000 worth of damage. The company only carried $20,000 worth of insurance but they were financially solid enough to work through the setback. The second calamity was the so called �Panic of 1873�. In reality, it was a depression and it�s origins can only be rooted out through a meticulous analysis of cause and effect. Suffice it to say, on September 18, 1873 the largest banking house in the United States, Jay Cooke & Co, closed it�s doors in New York, Philadelphia and Washington. Wages and prices dropped drastically and as a result, 23,000 businesses failed and 3,000,000 people were unemployed. The Studebakers finished that year with a record $820,000 in sales but then the collapse had come at the end of the year. They knew the road ahead would be rough and they braced themselves for it. They cut production from a vehicle every 10 minutes to one every 20 minutes and tightened the belt wherever they could. In some ways they actually benefited. Raw materials, for example, were selling for a fraction of their previous price. 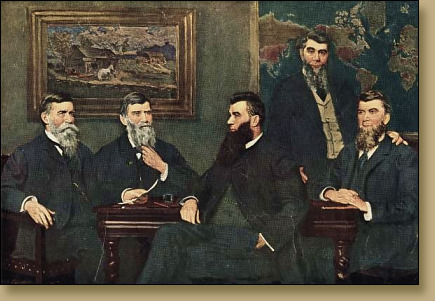 They didn�t pay any dividends in 1874 but they survived. What did ravage them that year was another fire. A big one. This one started at 4:30 in morning on August 24, 1874 and was already out of control when it was discovered. This time damages were on the order of $300,000 and two thirds of the factory lay in ruins. It appeared to everyone it all was over. Not to the Studebakers. They were determined to keep their enterprise going. After the fire, employees pooled their resources to help rebuild the factory. The brothers were appreciative but declined the offer. They went to the banks to finance their reconstruction and when it was complete they boasted the world's largest wagon factory. The Studebakers had always been critical of South Bends fire main. When city officials finally installed a new main after the fire, it was not to the Studebakers liking. To prove the system inadequate J. M. wagered a cow that the fire hoses couldn�t reach him on the top of their four story building. Amid great fanfare J. M. and a former vice president of the United States climbed to the top only to be drenched by five fire hoses. J. M. lost the bet, the cow was relinquished and everyone seemed happy with the outcome. The Studebaker brothers. Henry, Clement. Jacob, Peter and J. M.
The brothers had become industrialists. In 1875 sales topped $1,000,000 for the first time and in �76 they attended the nations Centennial where their vehicles won numerous awards. 1877 though, would mark the end of an era. John Clement, now 78, the man who had found a better life for his family and who had taught his sons to "always to give more than you promise", passed away. He left the world an amazing legacy in his sons and he had lived to see it all. The 80�s would see the usual ups and downs but, the Studebakers, it seemed, could handle any disaster fate could send their way. They were not however, prepared for a fiasco. The 1884 presidential election pitted James G. Blaine, the Republican candidate against Grover Cleveland, a Democrat. It was well known that the brothers had all voted Republican in the previous election and a rumor began that made it�s way to national newspapers. 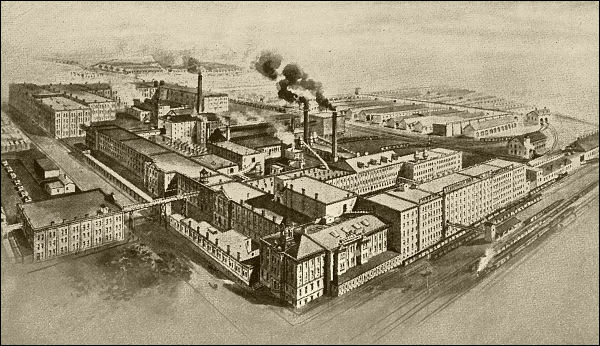 The Studebakers were being accused of coercing their employees to vote for Blaine. Of course, the rumor was false but, no one would listen. Telegrams arrived at South Bend from all over the country denouncing Studebaker. So outraged were the southern states that Studebaker wagons were burned in protest while demonstrators danced and chanted around them. The brothers went on record as being split in their preferences for president but that was of little consequence to sensationalist news papers. The election came and went and business went on. As the decade drew to a close, Jacob Studebaker age 43, died in December of 1887. The century would draw to a close with both optimism and sorrow. 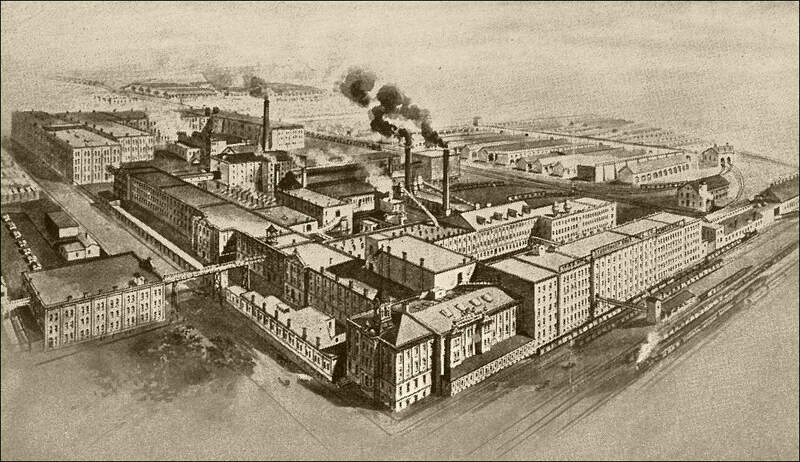 In 1891 an encouraging new addition was made to the firm. 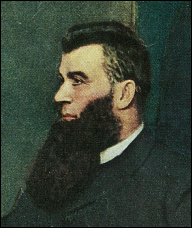 A corporate lawyer from New Jersey, Fredrick S.Fish, had married Grace Studebaker, John Mohlers daughter, and in view of his qualifications Frederich Fish practiced corporate law in New York City and had served as President of the New Jersey State Senate in 1887. was made director and general counsel. Fred was well liked by everyone and he was full of ideas on where the company should be going. Second generation Studebakers, sons and sons-in-law, were also joining the firm Sons working for the company were Col. George M. Studebaker, Clement Studebaker Jr. and J. M. Studebaker Jr. Sons-in-law who rose to prominent positions include Nelson J. Riley, Charles A. Carlisle, H. D. Johnson and William R. Innis. contributing their youth and enthusiasm to management. Sadly though, only two of the five brothers would see the new century arrive. Henry who been farming since his younger brother had bought him out, died in 1895. 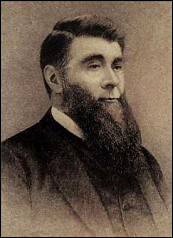 Then Peter, who had masterminded the national sales network, died in 1897. 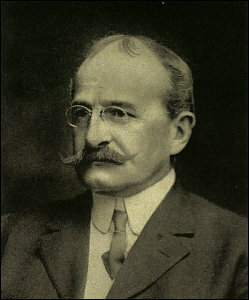 Fredrick S.Fish, 1852 - 1936. The last big bang of the 90�s occurred when the Spanish American War broke out in 1898. The Quartermaster of the Army contacted Studebaker to see if they could deliver 500 wagons within 36 hours. As with all their previous dealings with the Army, the answer was yes and the wagons left the factory in 24 hours. Sales for the last year of the century were over $3,900,000. Clement and John Mohler would see 1900 alone and they sensed sweeping changes in the offing. Army wagons bound for the Spanish American War.